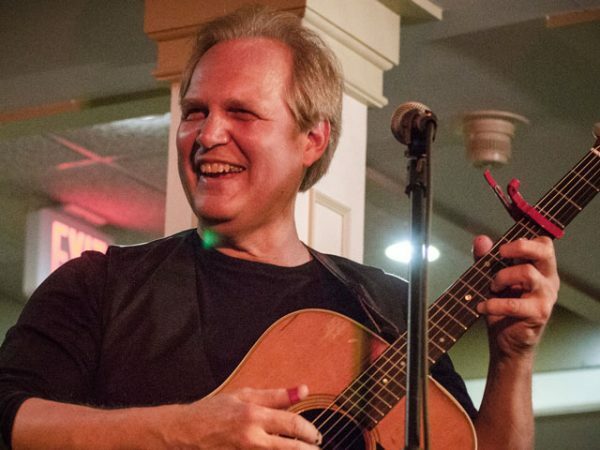 Greg Greenway, a singer-songwriter and folk-rocker whose songs take on a social conscious, returns as a soloist to Mansfield’s Rose Garden Coffeehouse at 8 p.m., Saturday, Sept. 15, 2018, kicking off its 30th season. Greg, known recently for being one part of the super trio Brother Sun, has relaunched his solo career, and now is taking on some new musical adventures. I caught up on the phone with Greg recently, since he was one of the Rose Garden’s earliest solo acts, to get a feel for what it will be like to have him return. He was last at the Rose Garden with Brother Sun (with Pat Wictor and Joe Jencks) in 2013, and prior to that all the way back to 2003. That’s near where our online archive begins, but I remember Greg playing at the Rose Garden before then. What I remember most about Greg’s playing is the power of his message and the strength of his delivery. His songs are memorable. 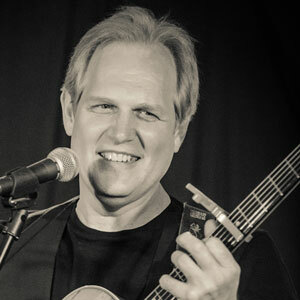 His guitar, piano and ukulele playing are always melodic, percussive and meaningful. Greg brings the audience into the song and keeps you there. I sent Greg a few questions to answer as he prepares his return. His responses are below. Come to Saturday’s show. He’ll give you even better answers. You don’t want to miss this one. Q.) Greg, this is the 30th season of the Rose Garden. You’ve played the show several times. Do you have recollections of the early days? What do you think contributes to the longevity of the Rose Garden series? What can people expect when you perform on Saturday, Sept. 15? GREG GREENWAY: My recollections of the early days are manifold. First and foremost, I remember being so grateful that the Rose Garden gave me one of my first opportunities to headline in the Boston area. I can see my old apartment on the Fenway and the beige rotary phone with Mac [McLanahan, the Rose Garden’s artistic director, who died in 2014] on the line. That will always hold a special place in my heart. The volunteers have always been so friendly; it’s like a family. I’ve always felt at home there. I have images in my head from multiple shows with various friend/musicians accompanying me, the last time appearing with Brother Sun. My last time in the building was sadly unforgettable. That was the memorial service for Mac. I think all of that addresses why the Rose Garden has endured – it’s the people. It’s always the people. It takes a village to maintain a coffeehouse. After being in Brother Sun for 8 years, people’s memories of my solo performance may be a little fuzzy. But, what I think they can expect is a songwriter who has always seen himself as a musician – and that’s a lifetime job. I’ve kept working on my voice, on my guitar playing, later on my piano playing, and most recently my ukulele. The greatest gift I got from Joe and Pat in Brother Sun was being around two very educated, very generous singers. So, I’m almost a completely different singer. Which for me, is so very freeing. I’ve always been equally dedicated to making people laugh as bringing up the difficult things about being alive. But, I think now, I’m looser, more confident, and just… better. Q.) Your career has progressed now and you are once again a solo performer and trying new adventures with Reggie Harris. Talk about your background, what you’re doing now, and how you think your music has progressed. GG: Reggie Harris and I were born three days apart, me in the ex capital of the Confederacy, Reg in Philly. His roots trace back to a Confederate general and a slave from the West Indies on a plantation just outside of Richmond. So, our DNA came through the same small portal on earth. We’ve been friends for over 30 years and have been able to freely address Race from the very beginning. When we discovered his Richmond roots, we felt it was the universe knocking. So we’ve put together “Deeper Than The Skin,” a musical presentation on Race in America. In the present climate, it’s a very healing, remarkable thing to be a part of. In my previous answer, I touched on the progress of my music. My hope is that people see it as more sophistocated, but even more accessible. It’s part of growing up as a performer – a wider vocabulary, more experience, more clarity. That goes for being a better person as well. Q.) In this time in history, how do you as a performer tap into the sensibilities of your audience? Have these even-more-socially conscious times changed the way you perform and the songs you write? What moves you as a performer? GG: This question always comes up in the context of Phil Ochs song nights. I usually say that Phil wrote for a charged up audience. His most popular songs were banners for a movement. I came after that time, when audiences were entirely different. But, I’ve always written socially conscious songs. Cut #1 on my first CD is “Free At Last,” a song about Nelson Mandela. You learn early on that you won’t change minds by pointing fingers. You have to tell stories and hold up heroes. No one comes to be lectured to, they come to hear the truth beautifully expressed – the commonality of being alive in this day and time. In this political climate, things are beginning to become charged again. I was just at the anti-white nationalist rally in DC on August 12th. Fortunately, there were thousands of us and 24 of them (with their faces covered). We are very polarized right now. It’s of no value to further that polarization, not everyone who disagrees with me is to that white nationalist extreme. To my audiences, I say, “November, November, November.” As I understand it, the last presidential election was the lowest turnout in 70 years. We don’t get to choose our families, we all have bills to pay, baby showers to go to, funerals. We all have our hearts broken. And in spite of all of the illogical, ironic, irrational dissonance of this reality, we all get up every morning and start over. This is what moves me, and drives my performance. Something I learned from a Native American speaker is so fitting. When you speak before the circle, you acknowledge all of the wisdom and life experience present in the room. You say that all I know is my experience, my story. Then you ask, “May I tell my story”?